Here is the 2018/2019 Schedule Poster. Feel free to print or share the poster. Membership rates for the 2019/2020 season TBA. 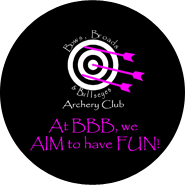 The Bows, Broads & Bullseyes Archery Club shoots every second Friday from 7 PM - 9 PM during our shooting season (October to April/May). If you are renting equipment from Heights, please be sure to come a little early, to arrange your equipment and so that you are ready to start at 7 PM. Each evening will begin with practice time. And, then, as they say, "Let the games begin!" We are please to offer a low-cost annual membership fee, with full and half membership options to women 18 years or older. Members can also split their payment so the cost isn't all up-front. And for those who join us later in the season, we will pro-rate your fees. Membership fees are club fees only (including costs of targets, range fees, etc.). 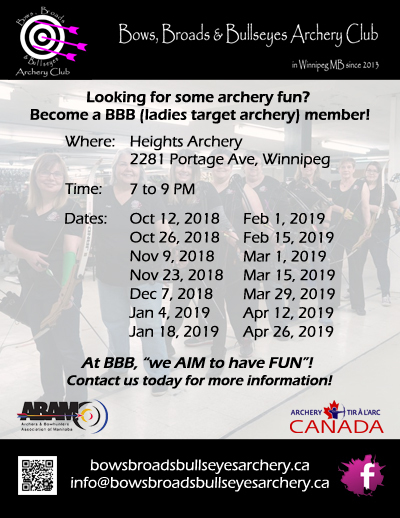 For those members without their own equipment, Heights has extended the offer of $5.00 per shoot (plus taxes) to rent your equipment from them (compound or recurve). 1 Each member must also hold a valid ABAM membership - ABAM memberships ($35 per year for adults) are valid from January 1 to December 31 each year and cannot be prorated. Our club can collect the ABAM fees from you and submit them on your behalf. ABAM now accepts membership application and payments on their website. 2 For Trial members only, first-timers can shoot with us once before having to pay for your membership. Unless you already have a valid ABAM membership, we will collect $5 for a temporary ABAM membership that the club will submit to ABAM on your behalf. 3 To become a member after a trial shoot, we can prorate your membership based on the date of your first shoot. You will be required to hold an valid ABAM membership. 4 Temporary ABAM fees can be applied against the cost of the annual ABAM membership if you become a member at the end of your first shoot. For those who don’t already have an annual ABAM membership, you will need to get one to be a BBB member. Ladies who take lessons at Heights have an ABAM membership included in the cost of their lessons. And for those members who are considering purchasing their own equipment, please remember that Heights has a lay-away plan. You purchase your equipment from them and pay it off over a short time. You leave the equipment with them until you have fully paid it off. You can use it everytime you are at Heights for our club nights or during other practice. Once it is paid for, you take it with you. We have three options for our members to save money towards their membership for next year - Executive Officer credits, Volunteer Credits and Buddy Credits. All credits will be applied the season following the season earned. Executive Credits - For those who sit on our Executive Board, they each earn a credit of $10 off your membership for the following season. In order to sit as a member of our Executive, you must be a shooting member of at least one year. Each Executive position is for a two year period. Elections are held at each year's AGM - President and Treasurer one year, Vice President and Secretary, the next. Executive members usually attend two Executive meetings per season (although impromptu meetings may also be held as required). Volunteer Credits - For those who volunteer at Competitions and other events as determined by the club's Executive, you will earn a credit of $10 off your membership for the following season. Combined credits in excess of one's membership costs in any given season or credits not used in the following season will be forfeited.